In May 2000 Maria Schneider directed the SWR Big Band in a bipartite programme live at Villa Berg in Stuttgart. The first half was largely taken up by the work she composed for the 1995 Monterey Jazz Festival, the Scenes from Childhood Suite, whilst the second focused on a commission from the SWR to mark the centenary of Kurt Weill’s birth, and the 50th year since his death, with arrangements of some of his most popular pieces. The suite is large-scale and in three parts lasting nearly 40 minutes. It opens with a rocking powerhouse called Bombshelter Beast with a sinewy electric bass pulsing away, and saxophonist Rainer Heute proving a strong soloist. Schneider is invariably good at contrasting textures and orchestral mass and she thins down to allow Klaus-Peter Schöpfer’s electric guitar to emerge sparely and get incrementally avid. The central movement is inevitably more reflective, with a suitably watchful soprano sax solo from Peter Weniger, and a fluid flugelhorn solo over spare backing, that briefly flurries and subsides again. The finale, Coming About, captures the exuberance of Minnesotan lakes in Schneider’s childhood and there are long chances for solos from pianist Martin Schrack and tenor player Andreas Maile. It’s an extrovert and loquacious way to end. The final track on the first disc is Allégresse which is cast strongly in the mould of Gil Evans’ way of doing things, from pastel colouration to the exhilaration of the soloists; it’s especially intriguing to hear the brass and soprano sax solos run independently but in parallel. The long Dance You Monster To My Soft Song opens the second disc and Some Circles closes it and both are Schneider compositions and arrangements. The first-named is somewhat innocuous but the latter is a melancholy ballad with more Evans-like voicings; a restrained, almost sombre way to end things. In between there are the Weill arrangements.Mack the Knife is fast and furious after a quirky start, Trouble Man is lightly orchestrated, and there’s a rather funky bass line to Speak Low. Some of the most committed backing, orchestrally speaking, comes in the Alabama Song – nicely brassy – behind Klaus Graf’s extensive soloing. 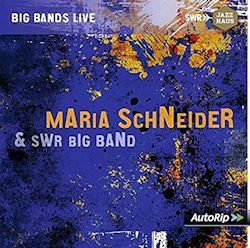 This release is part of SWR’s Big Bands Live series. It fits the bill nicely with decent notes and great sound quality. Whilst it’s hardly the best of Schneider, who has produced rather more subtle, suggestive and sensitive music elsewhere, it offers a chance to catch her hard at work with a forceful and powerhouse European ensemble.